The Salt Lake County Health Department (SLCoHD) has lifted the Warning Advisory for the Jordan Narrows, Blackridge Reservoir, and Wheeler Farm-East Canal after samples collected on September 11, 2018, were non-detect for anatoxin-a. This is the second consecutive week with anatoxin-a levels at non-detect. According to Utah Department of Health-Utah Department of Environmental Quality guidance, advisories may be lifted if test results fall below advisory thresholds for two consecutive weeks. Microcystin levels continue to remain below the recreation health-based threshold. SLCoHD has removed the warning signs from these locations. While the Warning Advisory has been lifted, health officials advise residents to continue to use caution when coming into contact with Jordan River water. The health department collected samples on September 18, 2018. SLCoHD will report toxin test results when it receives them from the lab next week. Results from the Utah Department of Food and Agriculture (UDAF) lab for samples collected on September 11, 2018. Samples collected by the Salt Lake County Health Department (SLCoHD) on September 4, 2018, at three locations along the Jordan River showed a decrease in cyanotoxin levels, particularly anatoxin-a. All samples tested by the Utah Department of Agriculture and Food (UDAF) fell below the recreation health-based threshold for a Warning Advisory for anatoxin-a and microcystin. SLCoHD lifted the Warning Advisory for Wheeler Farm since the East Canal tested below the recreation health-based threshold for anatoxin-a for two consecutive weeks. Warning Advisories remain in place for the two other Jordan River sites. The health department will collect samples tomorrow, September 11, 2018, to submit to the lab for further analysis. Samples collected August 28, 2018, by the Salt Lake County Health Department (SLCoHD) on the Jordan River and associated canals continued to show anatoxin-a levels exceeding the recreation health-based threshold at Jordan River Narrows and Blackridge Reservoir, although at lower levels than previous samples. All other toxin levels were well below the health-based recreational threshold according to test results from the Utah Department of Agriculture and Food (UDAF) lab. The Warning Advisory remains in effect for the Jordan River and its associated canals. 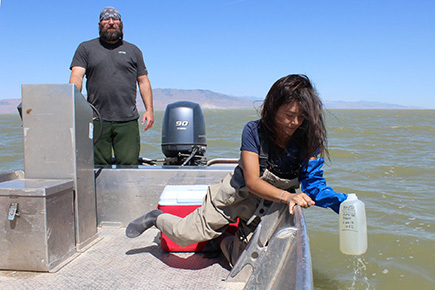 The Salt Lake County Health Department (SLCoHD) collected samples on August 21, 2018, at the Jordan River Narrows, Blackridge Reservoir, and Wheeler Farm. Lab results from the Utah Department of Agriculture and Food (UDAF) lab showed that anatoxin-a was detected at all three locations at levels exceeding the recreation health-based threshold for a Warning Advisory. Microcystin levels were well below the health-based threshold. SLCoHD has issued a Warning Advisory due to anatoxin-a levels above the recreation health-based threshold. The health department posted signs this afternoon in the affected areas.